In Greece, several different variations of the game are played. The game of backgammon as we know it here is called portas in Greek, meaning "doors." Each point is a porta. A closed door is implied. The game of plakoto is distinctive in that you can stop on an opponent's man but you cannot remove him from the board. You leave your man on him and he cannot move until you move your man off. Here, as in Moultezim, the point is to bear off your men as soon as possible and at the same time prevent your opponent from doing so by landing on his men and immobilizing him. The highest roll makes the first move. 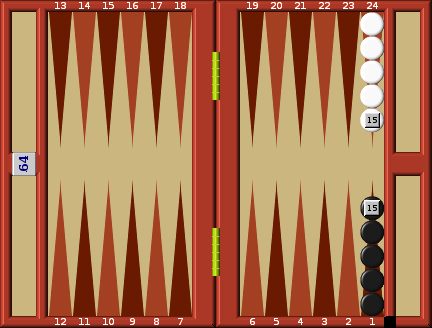 In this game, because your man can become immobilized by your opponent's landing on him, it is much more risky to leave a man exposed than in conventional backgammon. Making points is also much more important for the same reason.